Even though my children are too old now for a true "children's Bible", I chose to receive this book to review, because I am still always on the lookout for excellent materials for leading children to Christ and helping especially the "littles" in our families and those of our friends to be excited about Jesus Christ and God's whole plan for all of humanity. David Helm believes that no child is too young to begin learning about the greatest love story of all - God's love for His people, as portrayed in the Bible. 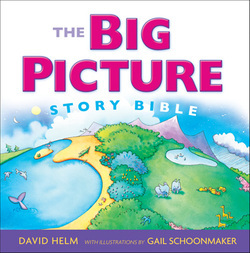 The Big Picture Story Bible is a wonderful book to be used with children ages 2 to 8, in my opinion, or maybe a bit older if the child has had little to no exposure to the Bible. This illustrated book was written specifically for children. The theme of this children's Bible is that God has kept His promises throughout all of time, and has shown His deep care and love to all people over the world's existence. The Big Picture Story Bible shows children the main truths of the Bible from both the Old and the New Testament, in chronological order. I know of many families who have been looking for something that is simplified so that very young children can easily understand the messages of the Bible, and this is one of those books that will fit this niche. The illustrations in this book are captivating and have been drawn from perspectives that are God-honoring and also interesting. The pen-and-watercolor pictures are beautiful, the kinds of illustrations that I would have enjoyed reading over and over again with my children when they were younger. It isn't common to find an adult ministries pastor who has such a heart for children and has been gifted by God to simplify the explanations of the Holy Scriptures so that even a young child can understand it. 1. The author refers to God with a capitol "G", which is entirely appropriate. However, when God is referred to as "him" or "he", it is presented with a lowercase letter. Maybe some of you will feel I am being nitpicky, but I have always felt that God was being disrespected if He was not presented with a capital "G" or capital letters at all times, much as if I were to see "Bible" written as "bible". 2. I do wish all Christian publishers would remove the word "story" from their children's Bibles. In our culture today, "stories" are typically made up, not real. I don't like our children seeing the word "story" on their Bibles. Yes, the Bible is God's Story, and I know that it is 100% truth, but children might have a difficult time sometimes, differentiating between a "true story" and a "made up story", especially if we use the word "story" to describe both. However, I really enjoyed this book, and my children would have loved it when they were younger! If you have been looking for a children's Bible for your youngsters or grandchildren, this may be what you have been looking for! The Big Picture Story Bible retails for $24.99 and was first printed in 2004. What are your favorite Bible resources you enjoy reading with your younger children? Disclosure: I received a free copy of this book in order to post a review here on my blog for my readers. No other reimbursement was provided to me.